The sentimentality in certain of Picasso's images from his Rose and Blue periods at the beginning of the twentieth century is unmistakable. It is also strategic. The Spanish painter had a native interest in emotive themes, especially those arising from the bohemia in which he was steeped in both Barcelona and Paris. 'The frugal repast' makes a powerful psychological appeal to the viewer. A thin-lipped woman of brittle demeanour and physique rests her head on a rigid hand as if it were a shelf. Her blind companion palpates her with fleshless fingers. The setting before them is as sparse as a desert landscape. For all this desolation, however, Picasso's self-consciously mannerist style makes it plain that this is not a slice of life but a work of art - a contrived one at that. Old Masters such as El Greco and Rosso Fiorentino were his models as much as the living ones Picasso doubtless observed. Stephen Coppel, Picasso and Printmaking in Paris , 'Early Picasso and Matisse', London, 1998, pp 9–10. Renée Free, AGNSW Collections , 'The Western Heritage, Renaissance to Twentieth Century', pp 108–72., Sydney, 1994, p 144, illus p 144. Renée Free, Look , 'Paris Blue', p 19, Heidelberg, Sep 1994, p 19, illus pp 3 (detail),19. The image appearing on page 3 is in detail. Modernism 1900-1950: prints and drawings from the collection , Sydney, 1994, np, illus cover. Bruce James, Art Gallery of New South Wales handbook , 'Western Collection: Works on Paper', pg. 78-92, Sydney, 1999, p 86, illus p 86. Great collections , Sydney, 2008, p 97, col illus p 97. 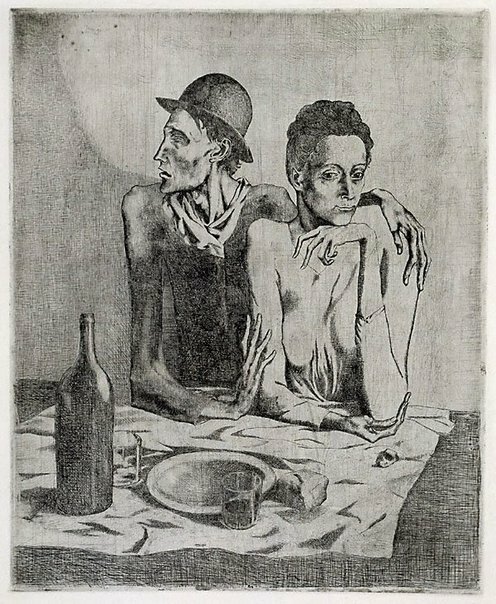 Unknown and Unknown, Picasso peintre-graveur. Tome I. Catalogue raisonné de l'oeuvre gravé et lithographié et des monotypes 1899-1931 , 1990, pp 18–20, no 2, illus p 20. Unknown, Picasso the printmaker: Graphics from the Marina Picasso Collection , 'Le Repas fugal and the Saltimbanques', pp 30–34, Unknown, 1983, pp 30–33. Unknown, Picasso: 60 years of graphic works , Unknown, Sep 1966, p 18. Unknown (Editor), Picasso: The early years, 1892-1906 , '1904-1905 ', Milan, 1997, p 229.